Mechanical Forest Sound: Recording: Moul D.
Recorded at The Beguiling (Defend the 11 Fundraiser), February 2, 2019. Comic shop The Beguiling organized this #DefendThe11 fundraiser for "members of the independent comics community... served with a defamation lawsuit because of concerns they raised about a fellow creator's alleged pattern of sexual misconduct", bringing together members of the overlapping comics and music scenes. 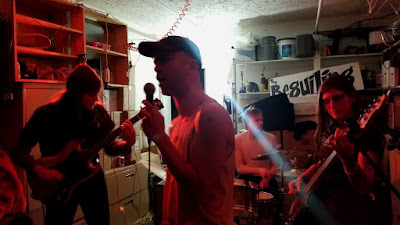 Adding some punk intensity to the night, this quartet has a second demo out since that last time I saw 'em – and is still managing to stuff in three-song bursts in the same amount of time less frenzied bands would manage one.